We’ve shared photos and ideas about kitchens with hardwood floors with you before and if you recall we presented a variety of hardwood flooring designs and stains. In this gallery, we are focusing on kitchens with light wood floors. 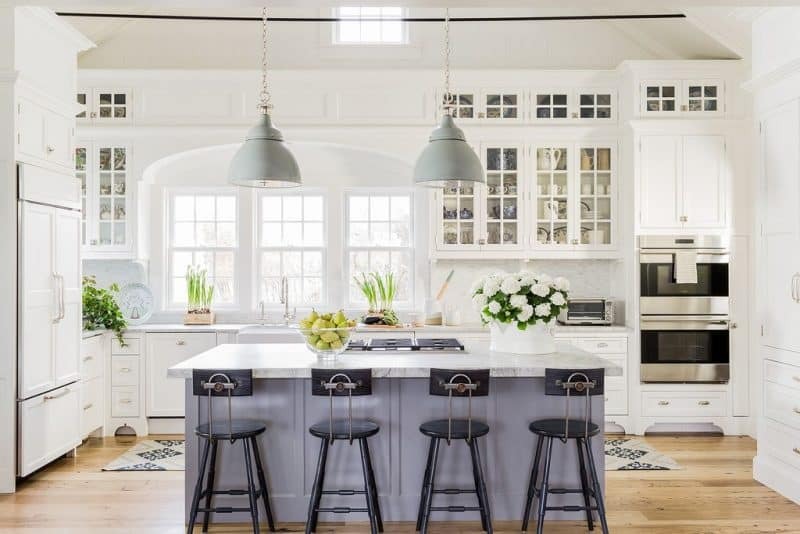 The advantage of kitchens with light wood floors is that they can easily brighten up a room and provide an illusion of a wider space — a big plus for small kitchens. As you will see from the photos below, it is also a great companion of cabinetry and kitchen furniture of different styles and colors. It is a versatile flooring option. 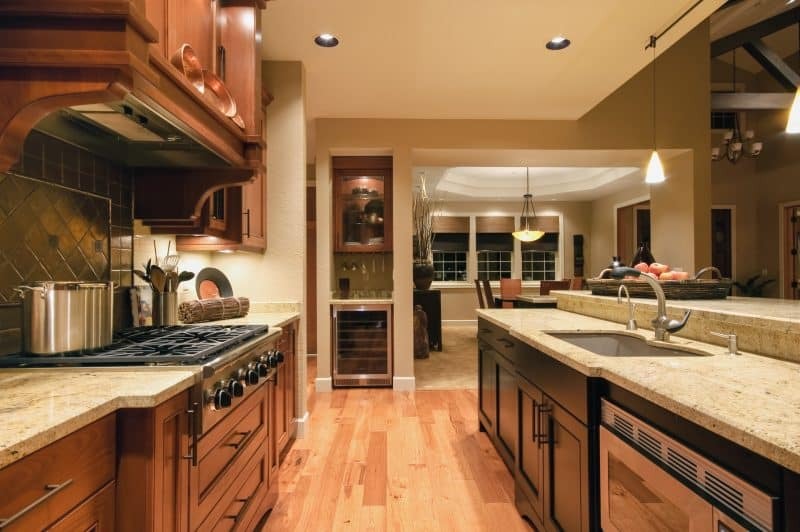 As far as maintenance and care, an advantage of kitchens with light wood floors is that dust won’t show as much. Now the trade off is that with dark wood flooring, those scuff marks from your teens or grandchildren (or maybe the big kid in your life…) will be more visible. You’ll just have to pick which one is less of an issue for you! So below are today’s selection of photos of kitchens with light wood floors that we thought may give you a few ideas. Hope you like them! Enjoy and beautiful day to you. The Little Plus: the bell light pendants hung from the box beam ceiling. 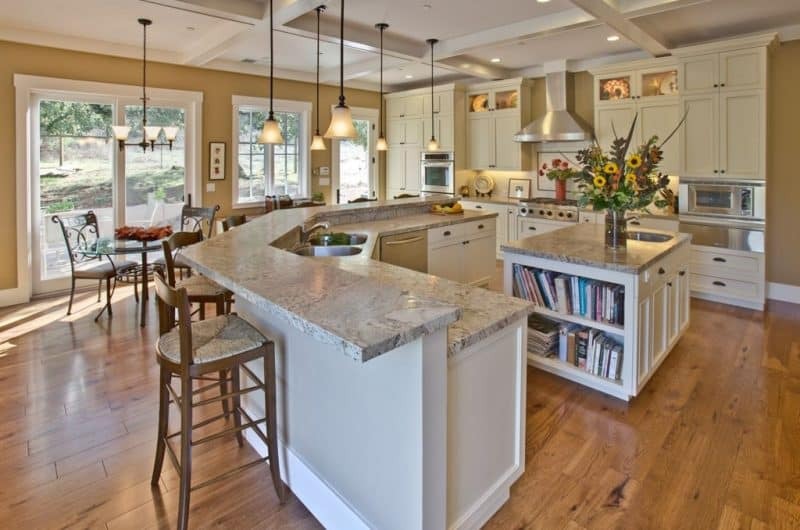 They draw attention to the long V-shaped granite countertop that dominates this kitchen. Notice how the center island granite counter doubles as a shelf — perfect for keeping your favorite recipe books! And let’s not forget the full view sliding doors that provide plenty of natural light allowing for some sunshine to hit the light wood floor making the whole room glow — oh joy! The Little Plus: the Ann Morris Rover light hanging pendant calling back the color of the island base. Also, notice how the black industrial atlantic stools add a welcoming dash of dark tone to this white and light blue-grayish color palette. And of course, how could you miss the gorgeous thick slab of Carrara marble — simple luxury! The Little Plus: the dark-hued tiled backsplash contrasts beautifully with the countertops. This adds visual interest to the backsplash. Also, notice how the cabinets below the sink are black to tie in with the dark wood cathedral ceiling beams of the adjacent room. The light wood flooring is a good choice to marry both the brown cabinetry on the cooking side and the dark cabinets on the kitchen bar side. The Little Plus: the reclaimed exposed beams and the unique spotlight pendant fixture it supports. 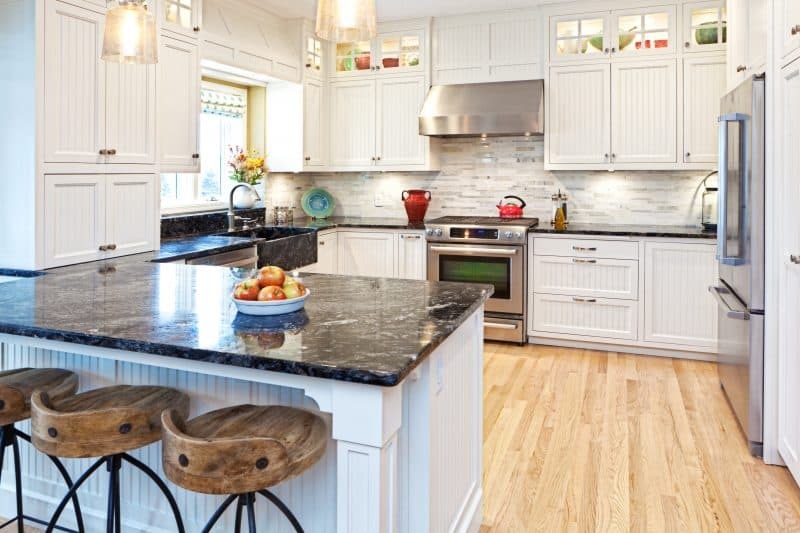 Also, notice the more casual white cabinetry with recessed panelled doors along with the elegant marble center island. 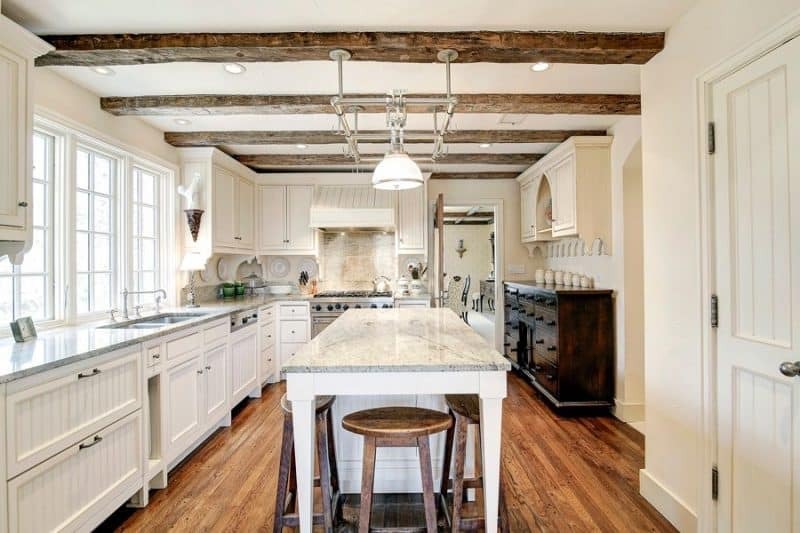 This brings a cottage feel with a small touch of luxury to this kitchen. And how about the hand stained solid dark wood commode in the back — looks like it had many lives, such a beautiful piece!